From Jean Baptiste Point DuSable to Oprah Winfrey, black entrepreneurship has helped define Chicago. Robert E. Weems Jr. and Jason P. Chambers curate a collection of essays that place the city as the center of the black business world in the United States. 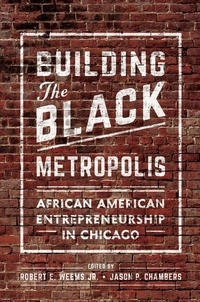 Ranging from titans like Anthony Overton and Jesse Binga to McDonald's operators to black organized crime, the scholars shed light on the long overlooked history of African American work and entrepreneurship since the Great Migration. Together they examine how factors like the influx of southern migrants and the city's unique segregation patterns made Chicago a prolific incubator of productive business development "and made building a black metropolis as much a necessity as an opportunity. Contributors: Jason P. Chambers, Marcia Chatelain, Will Cooley, Robert Howard, Christopher Robert Reed, Myiti Sengstacke Rice, Clovis E. Semmes, Juliet E. K. Walker, and Robert E. Weems Jr.